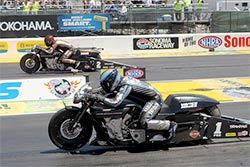 SONOMA, CA – Harley-Davidson® Screamin' Eagle®/Vance & Hines riders Andrew Hines and Ed Krawiec each qualified a Harley-Davidson®V-Rod® motorcycle for the Sunday elimination rounds at the NHRA Sonoma Nationals at Sonoma Raceway. Unfortunately for the team, their order in qualifying meant that Hines and Krawiec faced off against each other in the first round on Sunday, losing the chance to get race runs and valuable data with the team's new two-valve V-Twin engine. Because Hines lost that first-round race, he also missed an opportunity to move closer to the top 10 in points and qualify for the Countdown to the Championship playoffs later this season. Krawiec qualified in eighth position for Sunday eliminations with an Elapsed Time (ET) of 6.898 seconds. Hines qualified ninth just a tick behind at 6.899 seconds. Viper Motorcycle Company Buell rider Matt Smith led all qualifiers with a 6.838-second run. Krawiec faced Smith in the second round on Sunday and had a quicker ET (6.842 to 6.843) but Smith left the line first and got the win on a holeshot. Smith lost in the final round to Lucas Oil Buell rider Hector Arana Jr., who won his fourth event of the season. "It's good we found some performance [this weekend], and I think I had a bike that could have won in the second round," said Krawiec. "We just have to stay focused. We still have Indy and before that a few weeks off to do some testing and find more power. It's our home track and we don't have to travel, so that will maximize the time we have available to get ready." Hines will need some luck and a boost in performance to qualify for the Countdown to the Championship playoffs, which is set after the U.S. Nationals in Indianapolis in August. "I might need to win it all at Indy to make the Countdown," said Hines who is currently in 12th place in the standings. "It's been an R&D year for us, and we are still down about two miles per hour on the fastest bikes." After nine rounds of Pro Stock Motorcycle competition in the 2013 NHRA Mello Yello Drag Racing Series, Arana Jr. leads the class with 795 points. Smith moves into second place with 646 points. Sovereign-Star Racing Buell rider Michael Ray is third with 599 points, followed by Lucas Oil Buell rider Hector Arana Sr. with 553 points and Viper Motorcycle Company Buell rider John Hall with 534 points. Krawiec moves from eighth to seventh place with 465 points. Hines is in 12th place with 381 points. The Pro Stock Motorcycles will next race August 28 to September 2 at the 59th annual Chevrolet Performance U.S. Nationals at Lucas Oil Raceway in Indianapolis, Ind. 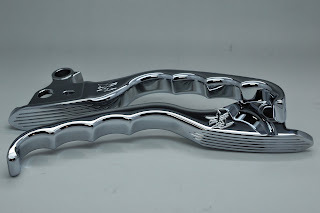 Sarasota, FL - Roaring Toyz, the latest manufacturer to hit the V-Twin scene introduces their Pin Stripe Series Billet Custom Clutch and Brake Levers. 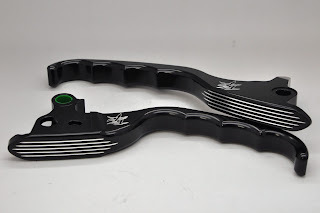 These billet hand controls were designed to be more comfortable and “responsive” than stock controls and are part of Roaring Toyz new Pin Stripe Series of Billet Parts and Accessories. They are the ideal blend of design and function…perfect for those long rides as well as “showing off” your ride at the local watering hole. 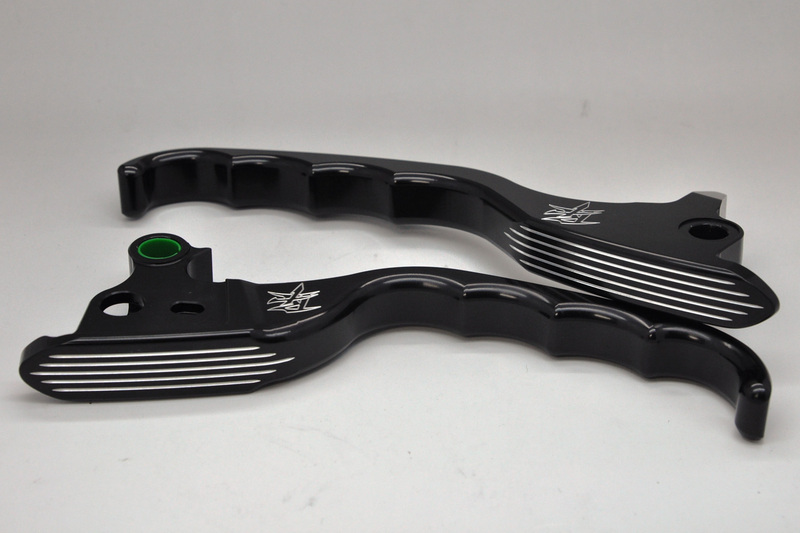 CNC machined from 6061 billet aluminum, these billet hand controls add style to any bike with our classy Pin Stripes and RT Logo. 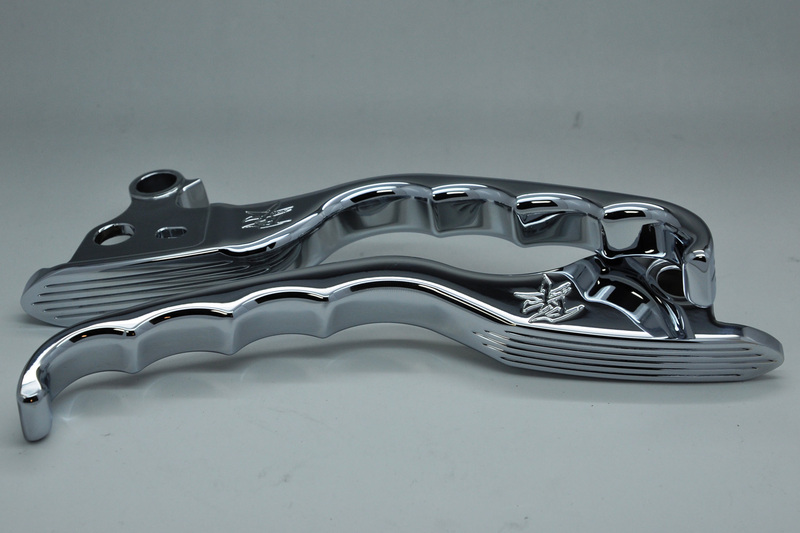 These levers not only look great, but they are comfortable and good for long rides with the perfect reach and profiled for your fingers. Ergonomically designed to accommodate riders with “larger than life” hands as well as the average rider, they work perfectly for anyone wanting a more comfortable hand position…and who doesn’t? Watch for other new exciting products soon to be released from Roaring Toyz. For those interested in obtaining more information on Roaring Toyz, you can reach them at 941-953-4423, email them at robert@roaringtoyz.com or check them out online at www.roaringtoyz.com.